Swedish newcomer Carolina Sjostrand possesses the kind of imposing beauty that was impossible to miss throughout the Spring/Summer 2014 show season. At 178 cm with piercing blue eyes, a strong Roman nose, and chiseled square jawline, Sjostrand was a commanding presence as she stalked the runways for Calvin Klein, Alexander McQueen, Christian Dior, Céline, Bottega Veneta, and Nina Ricci amongst others. Twenty-two year old Sjostrand's mixed Polish, German, and Norwegian background lends her a powerful, non-conformist aristocratic beauty reminiscent of nineties supermodels Cordula Reyer and Kristen McMenamy. Discovered only two years ago on the streets of Stockholm, Sjostrand was swiftly signed by her mother agency Stockholmsgruppen and is represented in New York by Wilhelmina Models. Sjostrand debuted on the international runway circuit at the Spring/Summer 2013 collections and has since become a firm favourite at the house of Christian Dior. In front of the camera's lens, Sjostrand's emits a chameleon-like quality switching one moment from menacing to softly demure the next depending on the editorial brief. Appearances in publications including Dahse, Wallpaper, Bon, Spanish Marie Claire, and the American, Swedish and Japanese versions of Elle are an indication of Sjostrand's universal appeal and 'model as muse' propensity. Sjostrand caught up exclusively with IMA in between appearances on the Couture Spring/Summer 2014 runways of Dior, Bouchra Jarrar, and Maison Martin Margiela, to chat about her phenomenal show season, key Fashion Week survival tips, and her favourite editorial shoots to date. Inoubliable Model Army (IMA): Hi Carolina, congratulations on a stunning Spring/Summer 2013 show season. Beginning with a Calvin Klein exclusive and capping off with a closing slot at Alexander McQueen! How are you feeling post shows and how did you decompress following Fashion Week? Carolina Sjostrand (CS): Thank you! I felt really happy and right now I'm excited for the next season. The first couple of days after the shows I just relaxed and spent time with my family. IMA: Would you mind sharing your backstory with IMA's audience? CS: I'm twenty-two years old and come from the outskirts of Stockholm. My mother is from Poland and my father is half-German, half-Norwegian, but I've lived in Sweden my whole life. A scout from my mother agency approached me while I was asking with my friend from Stockholm and after meeting with them I got signed. That was two years ago but I started working for real when I became a full-time model a year and a half ago. 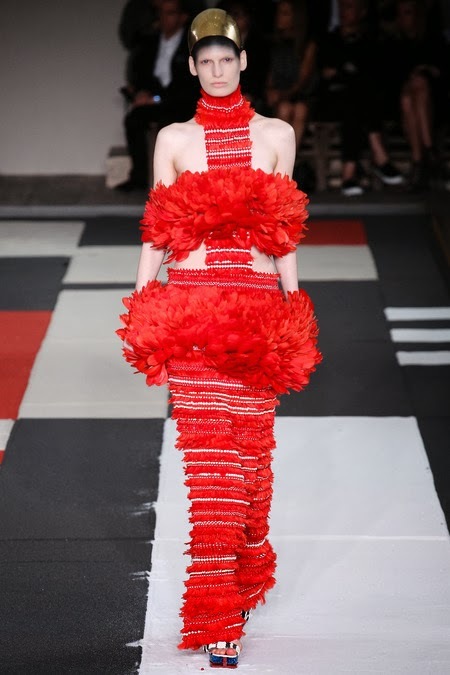 IMA: With appearances at Céline, Alexander McQueen, Calvin Klein, Christian Dior, Nina Ricci, Bottega Veneta, and Emporio Armani, are you able to recall a defining Spring/Summer 2014 moment that encapsulates how you feel about the overall season? CS: There are so many moments to choose from! The finale from Nina Ricci was just beautiful and the set of the Dior show in the garden to the Rodin Museum was incredible. Another defining moment was the Margiela show because there was a part of the runway which a huge window displaying the Eiffel Tower! IMA: Fashion Week is a true test of endurance both physical and mental. What are your survival tips for making it through the month long frenzy of castings, round the clock fittings, and shows? CS: Eat properly and try to relax when you can! I'm also a sucker for juices, healthy ones, to get my vitamins and such. I like wheatgrass shots, not so much for the taste but it makes me feel great, and I love the combo of carrots, ginger, and orange. I try to eliminate sugar as much as possible because it makes me feel tired, but I have a sweet tooth to it's quite difficult haha! IMA: Stockholm is a city celebrated for its design and fashion culture. What do you love most about Stockholm and where are your favourite local hangouts? CS: Come to Stockholm in the Summer or during Spring time. My favourite time is at the end of April/beginning of May when the cherry blossom trees in Kungstradgarden (King's Garden) bloom. During the Summer I love to go to Djurgarden, where there are plenty of nice museums, a big zoo, and best of all the theme park Grona Lund. IMA: Let's talk about that Calvin Klein exclusive! What was involved in the casting process and at what stage did you find out that you had been confirmed? CS: I got a call from Wilhelmina that I was confirmed just after the casting with the Calvin Klein team! That was about one week before the show. It was such a cool moment! During the casting I was quite nervous, Calvin Klein was on my list of dream shows to do, so my main concern at that point was to remain calm and just do my best. IMA: Wilhelmina and your mother agency Stockholmsgruppen have carefully guided your modelling career over the past year. What has been the most sage advice that your agents have offered you throughout this process and what advice would you pass onto young aspiring models? CS: I've gotten a lot of great advice from all my agencies, but probably one of the best was to always bring snacks with me, because sometimes it can be very hectic and there's no time to buy anything to eat. Another great piece of advice is that every model's career is different - some girl's careers might take off the minute they get signed, some others take longer to breakthrough. IMA: A model's sense of style plays a key role when presenting to clients. How would you describe your sense of style and if you could have walked off the runway with any of the looks you wore this season, which collections would they have come from? CS: All of them haha! My own style is basically jeans and t-shirt, simple as that ;-). IMA: You're steadily racking up an impressive list of editorial appearances for Bon, Dahse, Spanish Marie Claire, Harper's Bazaar Singapore, and the Swedish, American, and Japanese editions of Elle. What do you appreciate most about the photographic component of modelling and has there been a favourite editorial shoot to date? CS: Working with different people and learning about their artistic input is such a great experience. I love how it's not just about being pretty but also creating an interesting image with different components such as scenery, clothes, and make-up. I've had so many favourite shoots! Being in Moscow on the Red Square with Dior is something I will never forget. The editorial for Dahse was show in a burned down castle so the set design as so cool and we were surrounded by history. IMA: What do you hope to achieve in your modelling career, and do you have any long-term career goals? CS: I'd like to see how far I can go, this is just the beginning! I have so many people I want to work with and just choosing a couple is really difficult. I'd love to work with Steven Meisel and Inez & Vinoodh. Peter Lindbergh is someone I've admired ever since I started to realise what fashion really is. For magazines I'd love to work with i-D, Vogue, W magazine, and many more! IMA: What are the key principles which guide you through life and the challenges you face as a model? CS: To enjoy and appreciate what you are doing! Sometimes I just think "Wow, I can't believe I get to do this". CS: I'd like to think that every person is unique in their own way and so just being myself makes me unique.